Coastalplain staggerbush, photographed at Yamato Scrub Natural Area, Boca Raton, Palm Beach County, in April 2016. 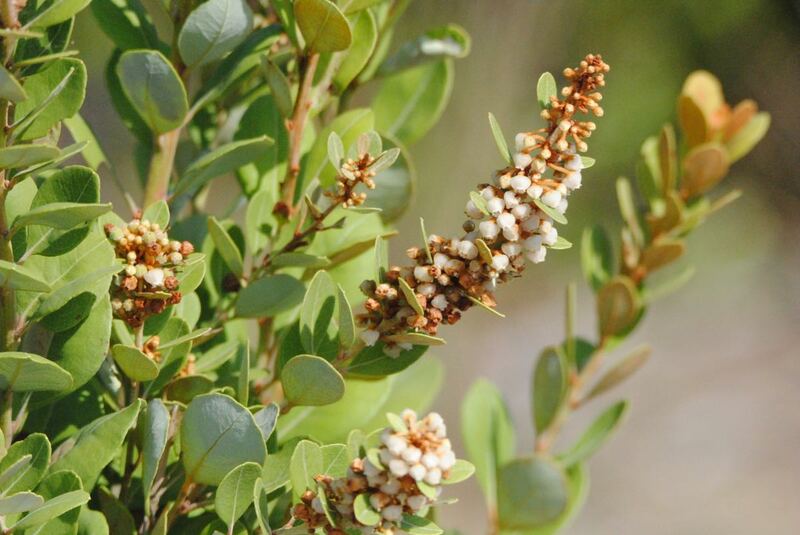 Coastalplain staggerbush, Lyonia fruticosa, gets the first part of its name from the fact that it's found mostly along the Atlantic and Gulf coastal plains. The origin of the second part of the name isn't so certain. Story number one: the plant is toxic, and cattle grazing on the stuff stagger afterwards as a result of the poisons they've ingested. Staggerbush. Story number two: the plant grows densely and is an impediment to foot traffic, causing anything trying to move through the stuff to trip and stumble about. Staggerbush. 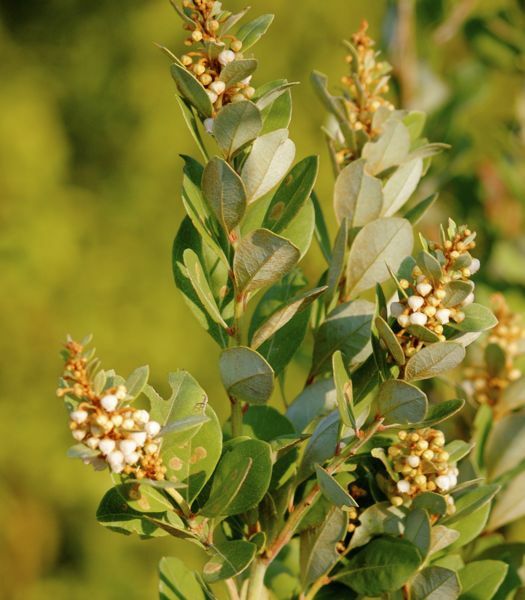 Perhaps both are true, although we note that Staggerbush is a cousin to fetterbush, Lyonia lucida, which almost certainly gets its name for reason number two. And other than in connection with its name, we've not read that staggerbush is poisonous. 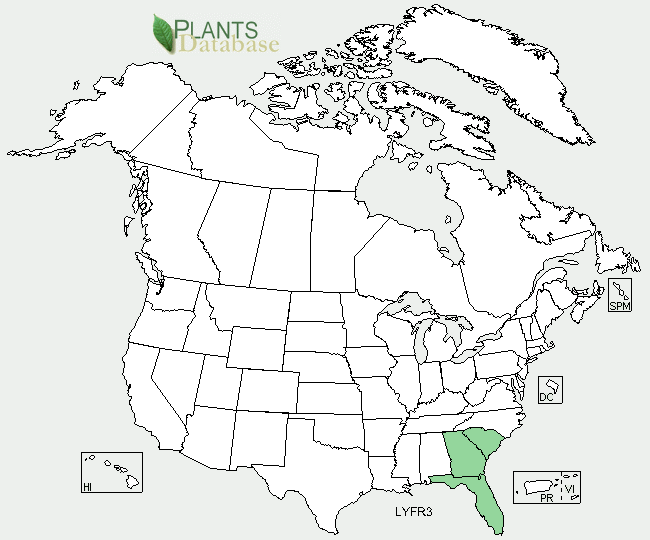 In any regard, staggerbush is a Florida native found throughout almost the entire Peninsula and most of the Panhandle. It's also found in Georgia and South Carolina. It's found in pinelands, flatwoods and hammocks. 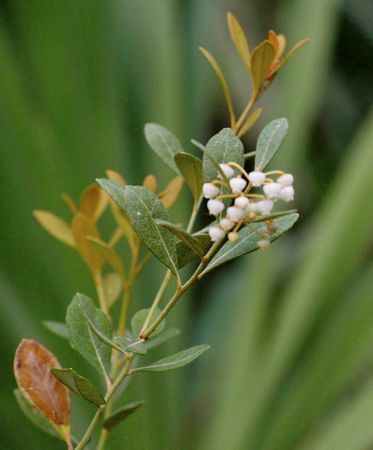 It's multi-stemmed shrub that grows to maybe six feet tall, according to some estimates; the University of Florida, however, puts staggerbush's upward limit at closer to 20 feet. The leaves are simple, elliptical or oblong in shape, smooth on the outer edge and one or two inches long. The underside of the leaves are covered with fine hairs that are especially dense on new growth and give the plant a coppery look, perhaps staggerbush's most outstanding feature. The hairs aren't there for looks, as the theory goes; they protect the plant from the ravages of hungry insects. Staggerbush also featurs masses of bell-shaped white or pink flowers. The blooms are small but clustered in spikes called infloresences. They appear March through December, peaking in June, and are an important source of nectar for bees and butterflies. The plant sometimes will develop unusual looking growths on its leaves caused by a fungus that's common among members of its family. The growths are bizarre but apparently don't otherwise harm the plant. Staggerbush can be used in landscaping as an accent or specimen shrub, border, foundation plantings, reclamations and restorations. It's fairly hardy — takes full sun and can tolerate drought — but it does like moist soils. A few commercial nurseries do sell it. Beyond the landscape, we humans haven't found a whole lot of use for staggerbush. The Seminoles used the wood to make bowls for their smoking pipes. And several years ago, staggerbush was one of 522 North American plants tested at the University of Mississippi to see if their extracts might have potential as a treatment against human African trypanosomiasis, commonly known as sleeping sickness. Our guy failed to make the cut but another familiar plant did: spatterdock. Coastalplain staggerbush is also spelled coastal plain staggerbush. Other names include poor-grub and rusty lyonia. Coastalplain staggerbush is a member of Ericaceae, the family that includes heaths, azaleas and rhododendrons. 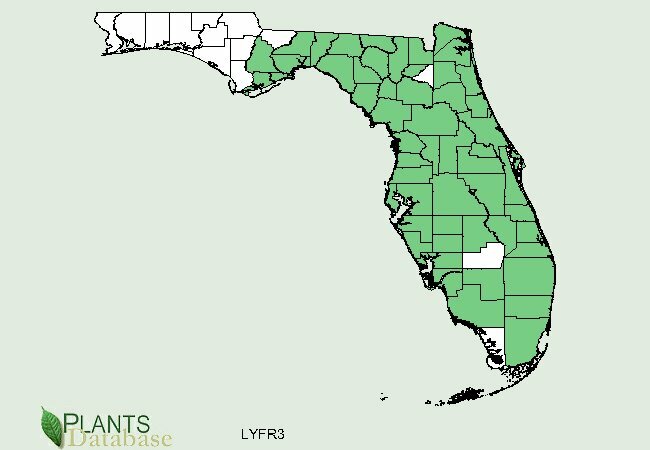 United States Department of Agriculture (USDA) distribution maps for coastalplain staggerbush.